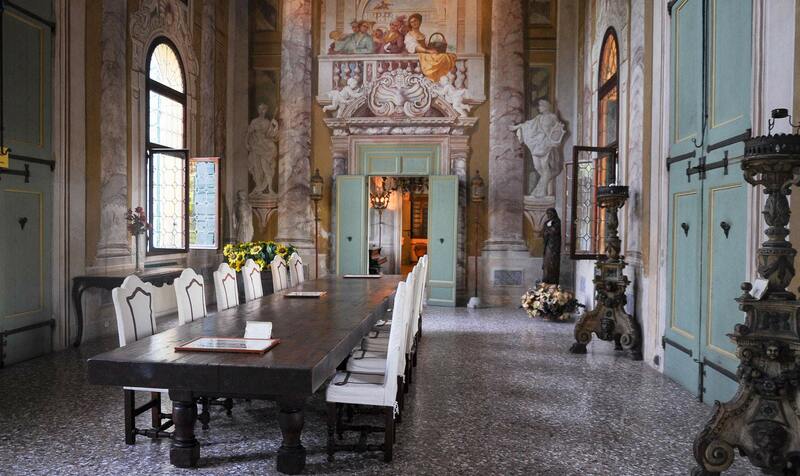 The Villa Barchessa Valmarana belongs to the rich artistic treasures collectively known as the villas of the Veneto region. 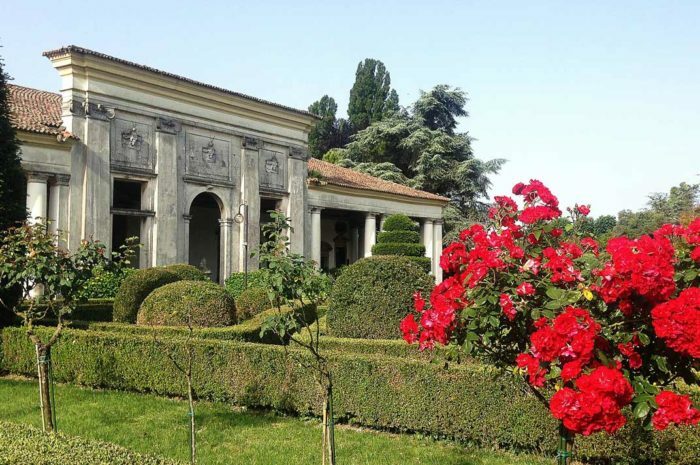 The Barchessa is all that remains of the 18th-century Villa Valmarana which originally consisted of two Barchesse, one emerging from each side of the Central Villa. 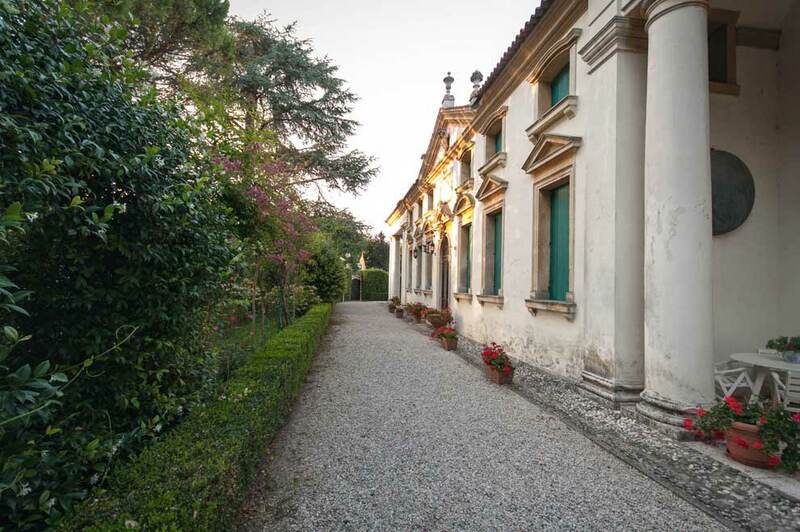 Until the end of the 17th-century, the “Barchessa” was the part of the villa used for agriculture and where one could use the porch to store their boats so they would not disturb the flow of traffic along the Brenta canal, if they were instead tied along the river banks. Thus, from the use of the Barchessa to store these boats (“Barche”, in Italian) originates the name Barchessa. The 17th century, the last century of the Marine Republic of Venice, was characterized by an ostentatious and hedonistic lifestyle typified by lavish parties that took place in the billows along the Brenta. It is precisely on the occasion of such parties, often lasting more than one day, that the Valmarana family found itself with many guests to provide for. 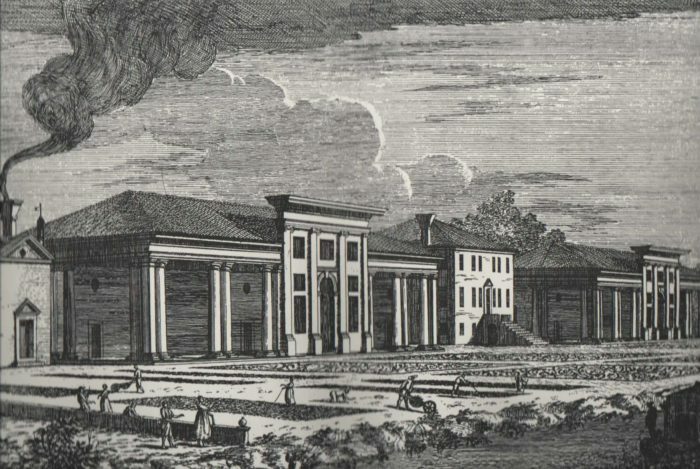 The main structure of the Villa where the family itself resided was sufficient to house only family members, so the Barchesse of the main family Villa overtime transformed into guest houses (foresterie, in Italian): from the word “foresti”, indicating relatives or friends, comes the word “foresteria. The interior of the villa was decorated completely with frescoes so as to demonstrate the ostentatious lifestyle of the Valmarana family. Standing under its decorations one can imagine the great parties thrown in by Prospero Valmarana in honor of the representative of the Bej of Tripoli with whom he had negotiated a commercial trade agreement on behalf of of the Republic of Venice. 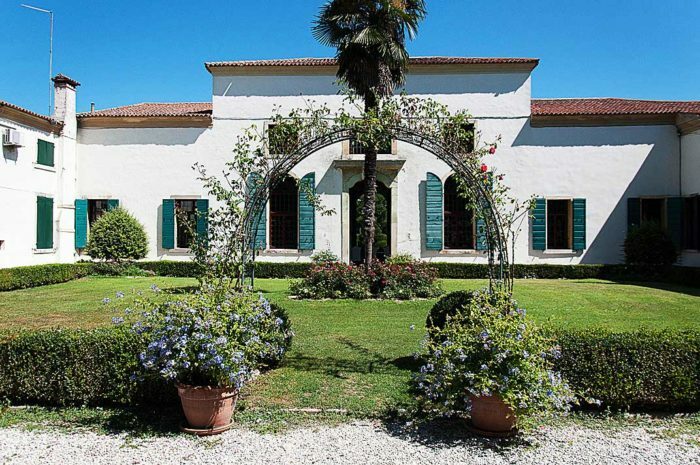 In the early 1900s, the Valmarana family have the main villa torn down in order to avoid paying luxury taxes on it. With the main residence gone, there remains only the two Barchesse which, in so far as they were used for the practical purposes described earlier, or not considered taxable as luxury buildings. The two Barchesse do not share the same destiny: one one on The left, complete with the small chapel in which one of the late members of the Valmarana Family is buried, came to be owned by six families who decided to structurally modify the Barchessa so as to obtain a more functional living space; the one on the right first becomes a wine cellar and Tavern and is later sold to the sculptor Luciano Minguzzi it takes it upon himself to restore the building and study its frescoes (1964-65). 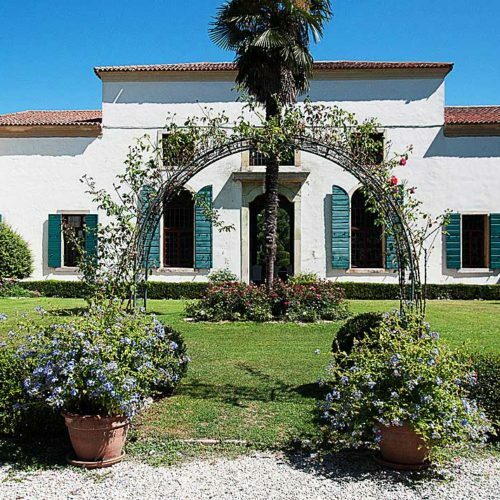 This complete and careful restoration has brought the Barchessa back to its past splendor: the monumental appearance of its vast portico adorned by two Doric columns is a manifestation of the fact that it was meant as a symbol of wealth and luxury. The interior furnishings of the house dating to the 17th-century, and the park surrounding the Villa merit individual attention and admiration. The part for example, and it’s classic simplicity, respects the rigid patterns of Italian style garden in strict interdependence with the entire environment of Villa. La Barchessa Valmarana appartiene al ricco patrimonio artistico delle Ville Venete. 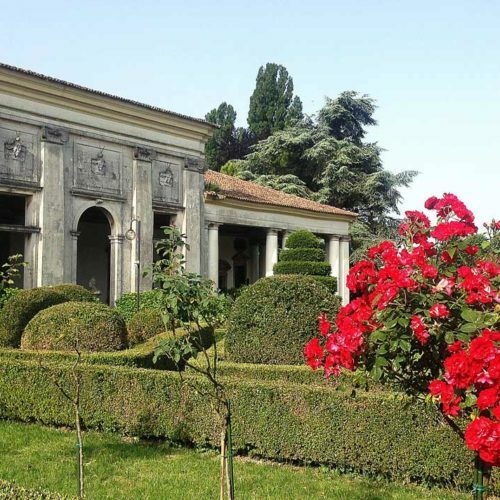 La Barchessa è ciò che resta della settecentesca Villa Valmarana, un complesso edificio costituito dal corpo padronale ai cui lati si sviluppano due barchesse. Fino alla fine del 1600 la barchessa era quella parte della villa che rimaneva al servizio dell’agricoltura, come granaio, e sotto le cui arcate venivano riposte le barche (da queste si trasse poi il nome barchessa), affinché non disturbassero il normale utilizzo del Naviglio del Brenta (era infatti vietato lasciare le barche attraccate lungo il Canale). 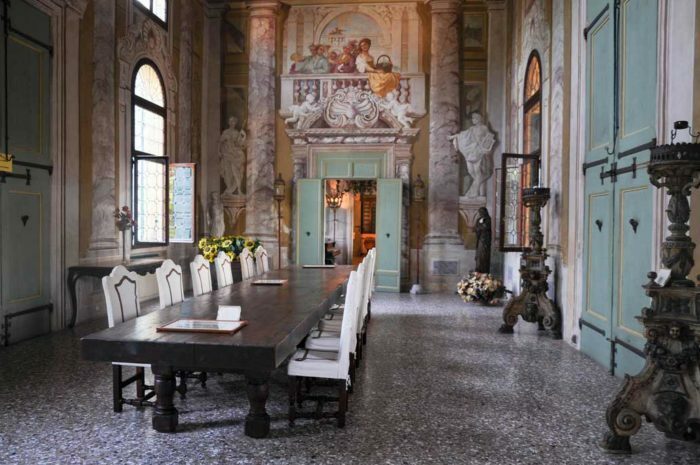 The Villa Barchessa Valmarana belongs to the rich artistic treasures collectively known as the villas of the Veneto region. 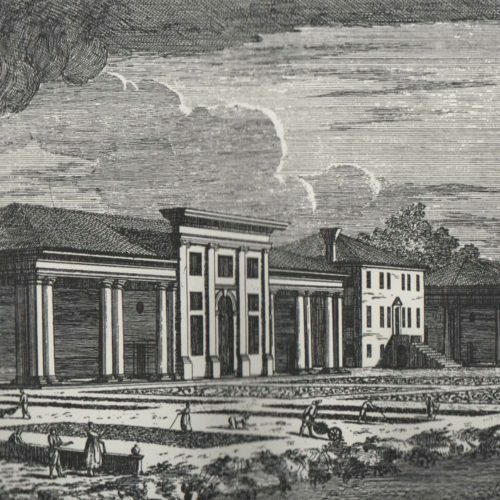 The Barchessa is all that remains of the 18th-century Villa Valmarana which originally consisted of two Barchesse, one emerging from each side of the Central Villa. Until the end of the 17th-century, the “Barchessa” was the part of the villa used for agriculture, under who’s in men’s porch boats were stored they wouldn’t disturb the flow of traffic along the Brenta canal if just tied along the river banks. Thus, from the use of the Barchessa to store these boats (“Barche”, in Italian) originates the name Barchessa. The 17th century, the last century of the Marine Republic of Venice, was characterized by an ostentatious and hedonistic lifestyle typified by lavish parties that took place in the billows along the Brenta. It is precisely on the occasion of such parties, often lasting more than one day, that the Valmarana family found itself with many guests to provide for. 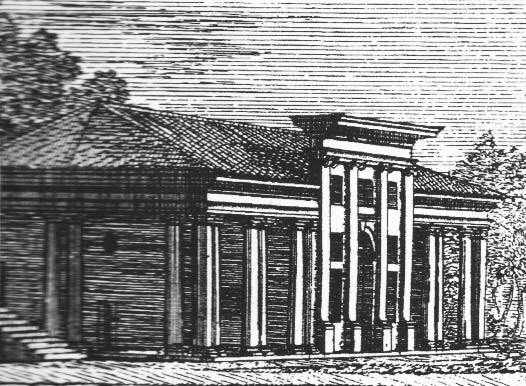 The main structure of the Villa where the family itself resided what’s sufficient to house only family members, so the Barchesse of the main family Villa transformed into guest houses (foresterie, in Italian): from the word “foresti”, indicating relatives or friends, comes the word “foresteria. The interior of the villa was decorated completely with frescoes so as to demonstrate the ostentatious lifestyle of the Valmarana family. 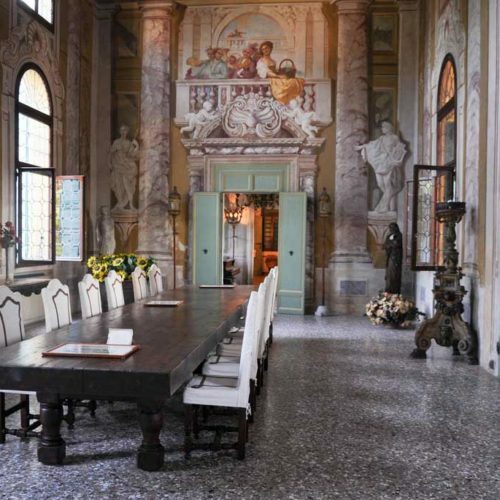 Standing under its decorations you can almost imagine the great parties thrown in by Propero Valmarana in honor of the representative of the Bej of Tripoli with whom he had negotiated a commercial trade agreement on behalf of of the Republic of Venice.